Tham, Jason. “The Problem of Ease: Risks and Rewards of Template-Driven Web Development.” Conference on College Composition and Communication (CCCC). Marriott Waterside, Tampa, FL. March 20, 2015. Recently, programming and web-writing courses have observed an exploded enrollment of young professionals and students who are eager to learn how to program and develop code literacy. Massive Open Online Courses (MOOCs) such as EdX and Codecademy are set up to accommodate this high demand from the public. Additionally, many open-source communities and individual developers are creating open-access frameworks, code libraries, and a wealth of customizable plugins that aid young developers to get their work done. While the rewards of creating and using such frameworks are of ease and efficiency, novice developers risk relying too heavily on the prefabricated works of others, allowing themselves to focus more on ease than skill. Such a practice may also misguide developers to becoming unaware of the larger cultural and functional contexts within which the technology was developed. Similarly, novice web designers may risk losing the opportunity to experience context-based web building when they rely on available design templates in developing their websites. The overall ease of usability strips away the developer and designer’s ability to exercise rhetorical agency over the development of an interface. To explicate the concerns central to the use and misuse of “easy,” readymade templates, I will examine website templates from WordPress.com to evaluate their design flexibility. Situating interface design and technical communication in the rhetorical tradition, I draw from the concepts of agency and techne, and look at templates as rhetorically designed spaces that can potentially limit a designer’s agency in constructing arguments, verbally or visually, based on the contexts within which they traverse. By not producing the design themselves, designers have little control over a large part of their representation on the web, and they are forced to compromise their autonomy in full self-expressions and identity on the web. 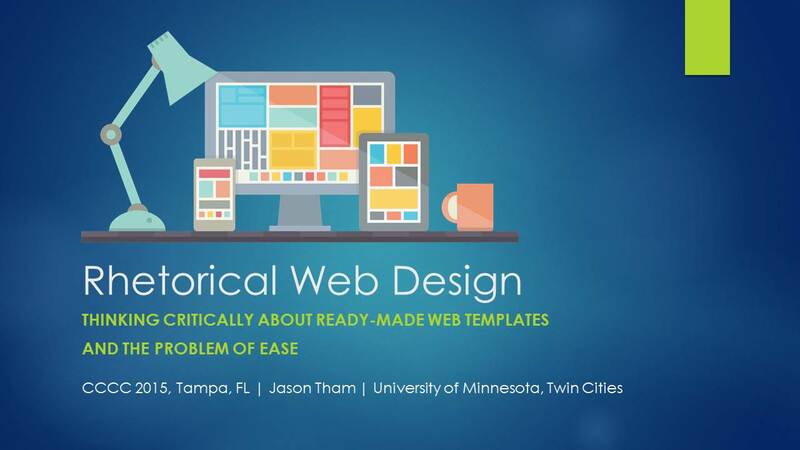 The purpose of this presentation is to challenge the validation of ease in using prefabricated applications and ready-made web templates – teaching users to analyze specific audiences and rhetorical situations in the design of websites, and to apply the principles of information architecture in the creation of a seamless user experience. Please contact me directly for more information about this presentation.